The first place we arrive was the Vincent House, which happens to be the oldest house in the island. It is a museum and a the same time a testament to how was life in this area cause it sports in its five rooms the different designs of furniture from four centuries. It was built in 1672, and I was amazed by how they keep even the tiniest of details of the original construction, which adds to the uniqueness of the house. It was a good place to rest a little bit and chill out. Then after ending our tour of that house, we headed to the Flying Horses Carousel. Once we arrived there it wasn’t a great thing, and actually I did said it…but my aunt shot me one of her “are you kidding me?” look, that made me stop in the tracks. As we headed toward the ticket selling booth, I saw a small inscription that made me realized that this place had an incredible story. 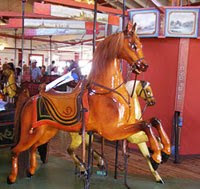 It was built in 1876, and you can pretty much figured out that it is the oldest carousel in America. It is listed as a National Landmark! It is so old that it doesn’t go up and down, it just go around. But they have created a nifty little game, and that was the game we all were playing. It is called “the brass ring game”. They put two brass rings in a specific time, and everyone is trying to catch it. You may be thinking how weird and that is piece of cake, but let me tell you how weirdly difficult it is, you have to stay in your saddle and there’s just the harness to hold yourself, and then you can stretch so much or you fall, if you fall you are out of the game. So we all were competing for the ring, I stretch my hands sooo much as to grab it and it was going to darn fast that I couldn’t get it, then in the other side my sister was reaching to the outer side ring and then she got it…one local was like shouting saying that she has been trying it for over 5 years and never had the chance to get it. We all went off the carousel and the only one standing was my sister, that little cheeky girl! It was funny to see a grown woman jumping up and down in that horse and with a beaming smile that was totally geeky!